WAIST HIGH: Never Underestimate The Power Of Cement. Never Underestimate The Power Of Cement. Not wanting to wait 11 months to post this on Nick Rhodes' birthday, I present to you the greatest discovery of the Summer of 2004. On a whim, Waist High asked the vacationing Amy Langfield to go just north of Wilson and New Stine Roads in Bakersfield California to see if still written in the sidewalk was the letters TA/NR. She went, and she found it. The story behind this is that Waist High friend "T" had a major crush on Nick Rhodes of Duran Duran for the better part of 1982 and 1983. 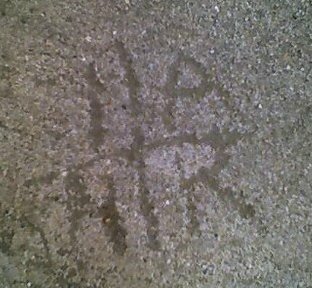 Evidently it was so major that we carved TA/NR in the freshly laid sidewalk.